My eighth grader has been working through the brand new writing curriculum from Apologia Educational Ministries called Writers in Residence. She had been using a different writing curriculum for several years, and I really felt like maybe a change in view point would benefit her. Out of all of my children, she is the one who enjoys writing and isn't intimidated by a blank page. She has always had a creative story or idea going on in her head. 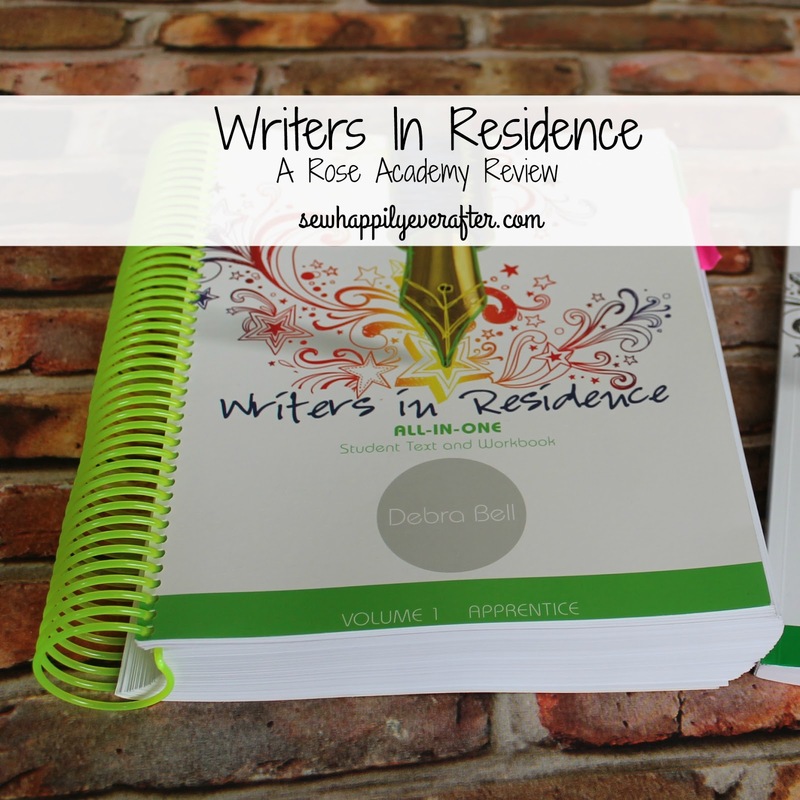 She is also a very good imitator of writing, so when this all-in-one language arts curriculum arrived, she was more than happy to dive right in. Almost immediately after this homeschool writing curriculum arrived at our door, she headed out on a surprise 9 day trip to Florida with her dad and grandpa. The agreement that we had was that she would work on her math and language arts for a small portion of each day. I went through the introduction with her and explained how the program worked. There is a schedule of suggested activities to accomplish each day, so we went over how to use that. The student book is written in a conversational tone directly to the student. I knew she could handle working independently while away from home. Each daily assignment took her about 20 minutes. So even with the promise of a trip to the beach, it wasn't hard for her focus and complete her language arts curriculum for the day. I was also available by phone or FaceTime if she needed help or clarification, but she really completed several assignments without needing my help. This curriculum is appropriate for grades 4-8. It is truly an all-in-one language arts curriculum including instruction in grammar taught in the context of writing. Inspiring author interviews are included right in the student book as well as grading rubrics. The answer key contains all of the answers to the grammar activities in the student book. I did allow my daughter to take along the answer key with her just in case she needed to check her work while away from home with the understanding that it was only for checking her work once it was completed. She didn't need to use it every day, and honestly, I probably could have graded the assignments when she came home. Another feature that I enjoy about this curriculum is that some writing assignments include famous artwork reproductions as inspiration to a writing assignment. The student book is a spiral bound book and we were both quite surprised at the size of it! Full color printing on the pages makes the curriculum appealing. The spiral binding allows the pages to lie flat or be folded back to work on a single side. This language arts curriculum does start with the very basics of the English language. Since my daughter is an eighth grader and has had a thorough background in grammar, the beginning exercises were very simple for her. That's not a problem, but it is a good chance to review those concepts. She has greatly enjoyed the deviation from our standard writing curriculum and the colorful pages really attract her attention. I appreciate how diligently she works on each day's assignments. I'm also pleased with the quality of the pieces that she has written. Would you like to read what other reviewers had to say about Writers in Residence? Check out the Review Crew Blog for more!